* This necklace and earrings set from Mariell features a pearl pendant with a trio of crystal rhinestones and matching pearl & crystal stud earrings. * This delicate silver plated set is a must have item in your wholesale jewelry collection for brides or bridesmaids who want a classic look at a fabulous low price! 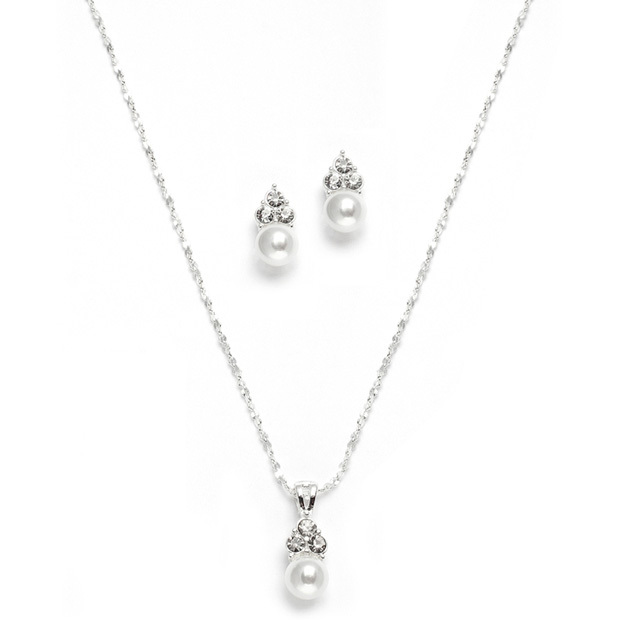 * Mariell's popular necklace & earrings set has a 6mm White Pearl pendant accented with a trio of crystal rhinestones on an adj. * 16" - 18" silver chain. * The set includes fashionable 6mm pearl & crystal stud earrings.